Michael Horodniceanu unveiling the MTA's new air monitoring site for the Second Avenue subway construction on Friday, June 8, 2012. YORKVILLE — Residents and workers along the Second Avenue subway construction zone can take a deep breath. Despite the dirt and dust from the digging and blasting, the Metropolitan Transportation Authority says the air is safe, and the agency is posting the data online to prove it, officials announced Friday. Every Wednesday the MTA will post updated air quality monitoring data from 10 locations between East 63rd to 96th streets on its website at www.mta.info/sasair for the pollutant, Particulate Matter 10. It can cause or aggravate such health problems as asthma, bronchitis or other lung diseases. Data collected on this type of particulate matter, so far, show that its levels along the corridor for the $4.45 billion project are generally a third below the national standard set by the U.S. Environmental of Protection, MTA officials said. "The bottom line is the air quality along the Second Avenue construction is good, and the air is safe to breathe," said MTA Capital Construction President Michael Horodniceanu. "The construction causes no damage to public health." Many residents have claimed that construction has caused or exacerbated asthma or other respiratory problems, calling it the "Second Avenue cough." The MTA's results show the daily 24-hour readings of the pollutant, but Horodniceanu said that samples are collected minute-by-minute and if levels that exceed standards are found during a 15-minute window, an alarm goes off and contractors take immediate action. Alarms have sounded once or twice, he said. The announcement comes on the heels of local pols calling for increased monitoring. City Councilwoman Jessica Lappin had introduced legislation to require the city's Department of Environmental Protection to monitor the air and pose monthly results online. State Assemblyman Dan Quart introduced legislation calling for the state Department of Conservation to conduct air quality analysis of the blasting area. Both were pleased that the MTA has launched a monitoring program voluntarily. "People who live and work near the Second Avenue construction site have been enduring dust and debris for months," Lappin said. "Now, we'll be able to breathe and sleep a little bit easier." City Councilman Dan Garodnick noted that having air monitoring on an ongoing basis was not a "panacea" for the challenges residents and businesses face but called it an "important" step so people aren't "kept in the dark." "So far the results are encouraging," he said. The MTA had conducted an independent air quality study last year that tested for a more comprehensive list of pollutants. Reviewed by the EPA and DEC, it, too, found that pollutants were below national and industry air quaity standards. 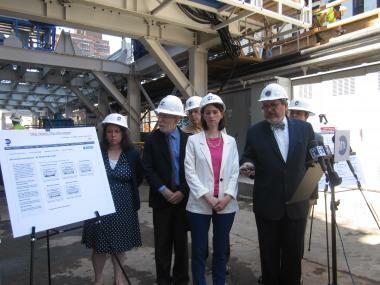 So far, the MTA has spend $3.5 million on measuring air quality at the construction site, Horodniceanu said. Barry Schneider, who co-chairs Community Board 8's Second Avenue Subway Task Force, said the montitoring was helping the "MTA in achieving transparency as it builds the Second Avenue subway." He said the agency has also stepped up it communications through meetings and newsletters and credits that to the declining number of residents who have been attending task force meetings. Last year, he said, an average of 140 people came. In March, it was down to 40 people, and last month roughly 20 people showed up. Jens Sell, who lives on Second Avenue between East 85th and 86th streets where he is the super of a building, has not been happy with the blasting, which was so strong this week, "I thought the building was falling down." But he said dust coming into his building was to be expected with construction. "I'm sneezing more than usual. I think a lot of people are," Sell, 34, said. "Dust can be dangerous if it's too much, like if you can't see your hands through it. Then I'd be more concerned. I'd be walking around like Michael Jackson with a mask on."